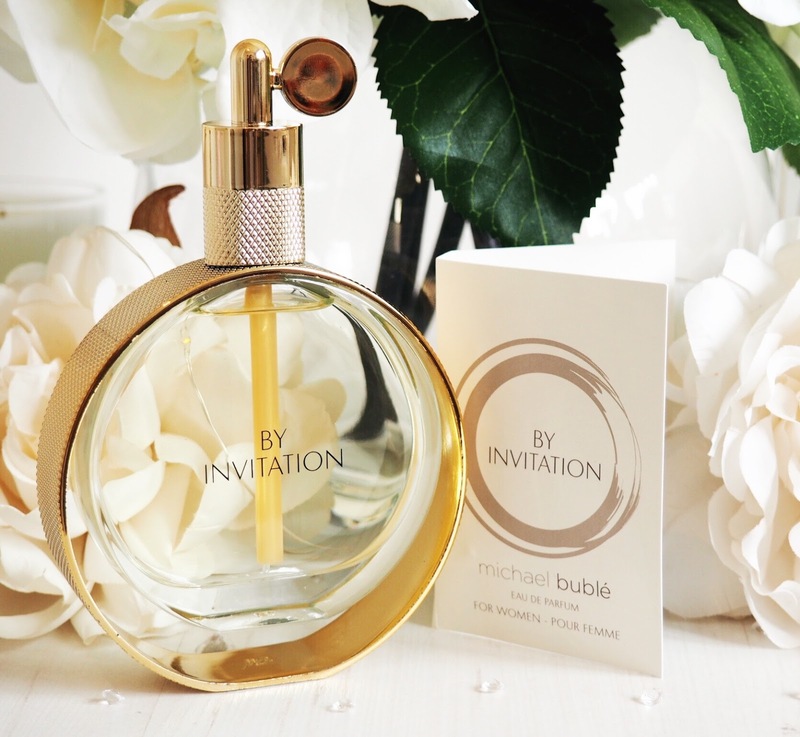 I still need to pinch myself, but I was fortunate enough to have been invited to the world exclusive launch of none other than Michael Buble’s new perfume – By Invitation. 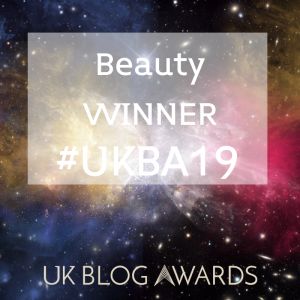 All thanks to the very lovely Hayley at London Beauty Queen, I was one of only seven UK bloggers in attendance. Let’s just say that nothing will ever be able to top that night as a blogger! Anyway, the launch was designed to showcase Michael’s new perfume to the world. We got a first look at the video, the promotional materials and of course, the perfume too. Not only that, but Michael himself was at the event answering questions on stage for a live Facebook event, with millions tuning in around the world. He performed some of his songs and let me tell you this: he’s just as talented in real life, actually no, he’s more talented in real life. Plus he’s every bit as cheeky and fun as you expect too. There were canapés, drinks flowing and some seriously elite people from the perfume world. It was an absolutely wonderful evening. I’m going to be honest here and say that as much as I was excited to attend the event, as much as I love Michael Buble (marry me!) I was apprehensive about the scent. I’ve been suckered into buying celebrity perfumes before and been disappointed with a middle-of-the-road perfume designed only to line the pockets of the celebrity at the helm… So I found myself wondering – would Michael Buble’s perfume measure up? 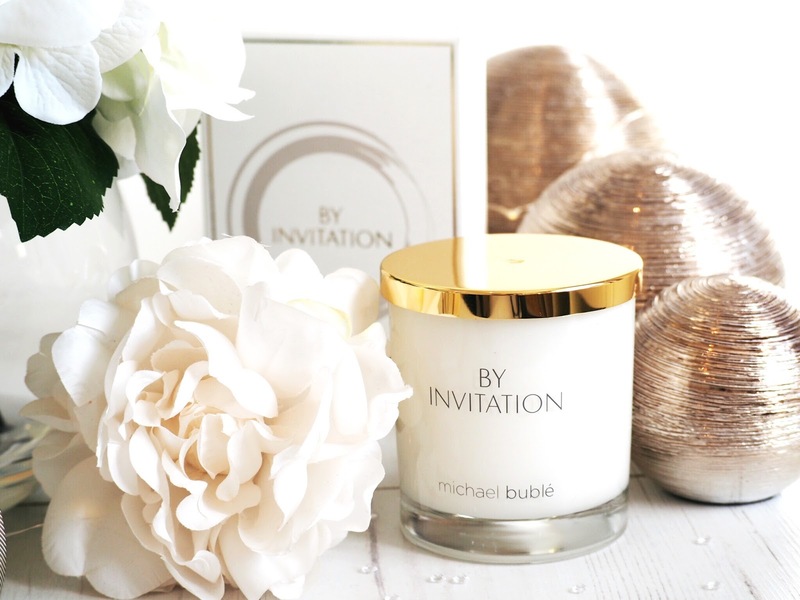 …Before the singing, before the drinks and delicious miniature sized cakes, before I decided that I should probably just marry Buble…before all of it, was the arrival, which is where my first impressions of the scent were made. As we entered the Ball Room where the event was being held there was no mistaking the smell. Light, powdery and incredibly feminine. It was everywhere, floating around the arrival hall, and getting even more prominent with every step up the stairs. 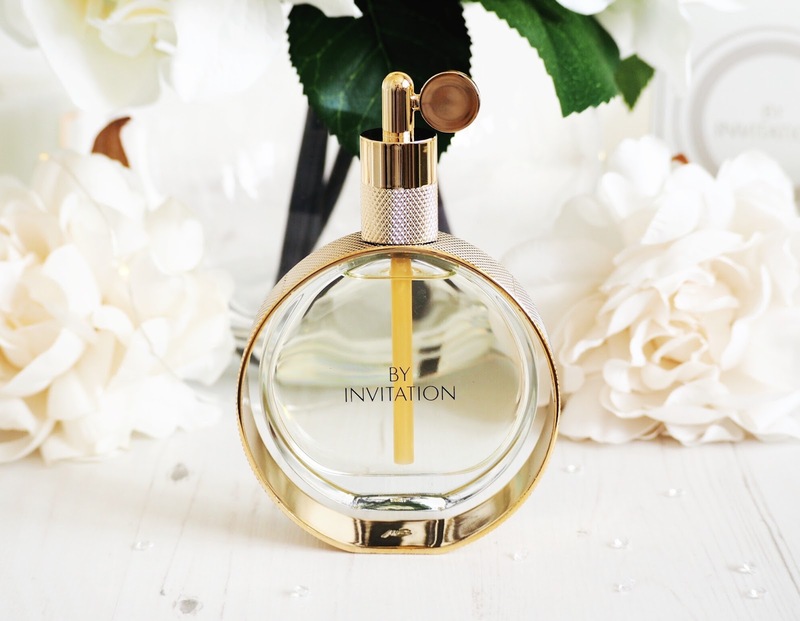 When we reached the desk we were given wrist bands emblazoned with By Invitation, which I quickly noticed were scented with the same beautiful scent I’d noticed as we arrived…confirming the scent I’d picked up on, was indeed the perfume itself. And I was seriously impressed. By Invitation is delicious and musky, but not at all heavy. It’s always hard to describe a perfume but in this case I just want you to think about something with the depth of a top level perfume, combined with musk that creates a lingering scent that sits on the skin and last for ages. It’s sweet but not sickly and powdery without being overwhelming. It’s an absolute joy to wear. Most importantly for me, and because this is a celebrity scent, this is a perfume that exceeds expectations and stands out from the crowd. It’s not like those other celebrity endorsement offers in bright bottles. It’s a truly beautiful scent with highly strong staying power (you can still smell it on your wrists the morning after.) It’s a perfume I’d buy again and again, and quite frankly it’s better than both bottles of other brand perfume I’d picked up at the airport on my way over to New York. But not only is the scent perfectly feminine, it’s also ageless. I think young women and the older lady can equally enjoy this scent because it’s timeless. It’s got a heady musk that I like, but a classic and elegant edge that means my mum has been known to pinch a spritz when she pops over, and she’s frequently reminding me how much she wants her own this Christmas. At the launch, Michael explained how involved he was with the creation of the scent – relying on his memories and relationships with his wife, mother and female relatives to create the scent he was imagining. I particularly liked that he mentioned the fact that if his wife and mother didn’t approve of the scent, he wouldn’t have released it. Meaning I believed him fully when he explained this was going to be a different type of perfume. Something unique. So it was lovely to hear how much his wife and mother both loved the final scent too. As a huge fan of his music, Michael can do no wrong in my eyes. His songs bring out the romantic in me and By Invitation was created to be a scent that bought out the same sentiment of romanticism – and let me tell you: it absolutely does. I feel feminine and ladylike when wearing this, and my boyfriend is a big fan too. Bottle-wise I’m reminded of a particularly top level perfume with this – which is a touch that’s not lost on me. 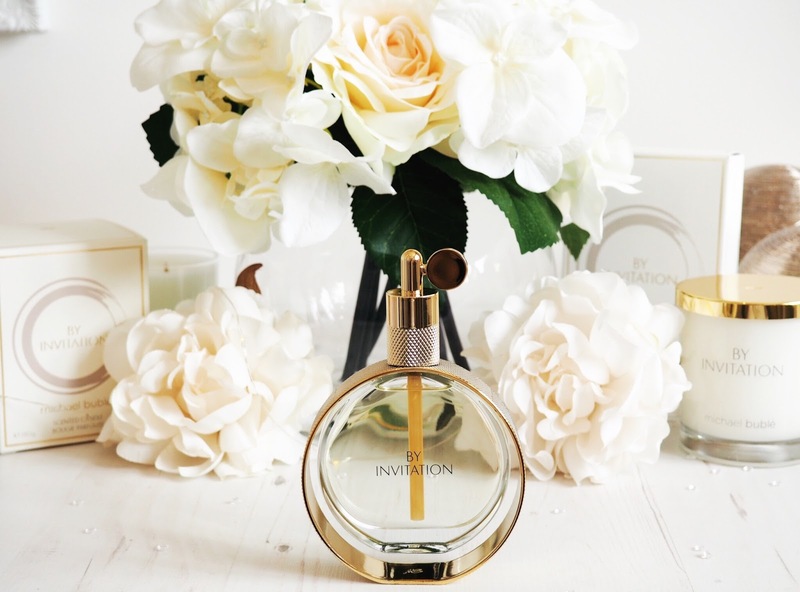 It’s an absolutely stunning bottle – classic, timeless and elegant: much like the perfume itself. And it’s something that will look absolutely beautiful on dressing tables. 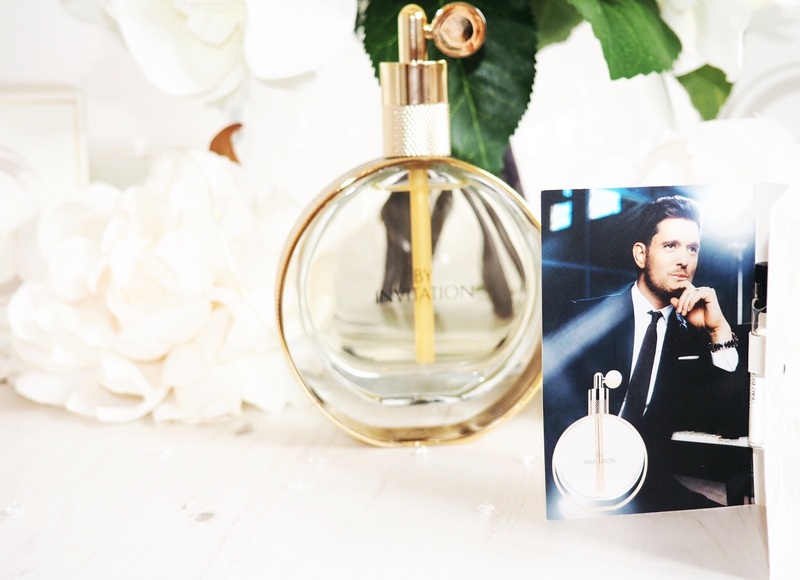 The perfume is now fully launched and available exclusively from The Perfume Shop or directly from Michael Buble Perfume. It’s a fantastic price for such a beautiful scent: £29 for 30ml, £39 for 50ml and £55 for 100ml. From the 25th September, the perfume then becomes more widely available with retailers such as Boots and Debenhams becoming stockists. And a final date for your diary is October, when the gift sets will become available… I’m hoping they have the matching scented candle included because they are absolutely divine, let me tell you. So, my thoughts on Michael Buble’s By Invitation? I couldn’t be more romantically involved with a perfume. (See what I did there?!) It’s absolutely blown me away. I will stake my claim and say it’s not only the best celebrity perfume I’ve tried, but it’s actually one of my current favourite perfumes and I will 100% be repurchasing it when it runs out – which at the rate I love to wear it, will be soon because I can’t get enough of it. 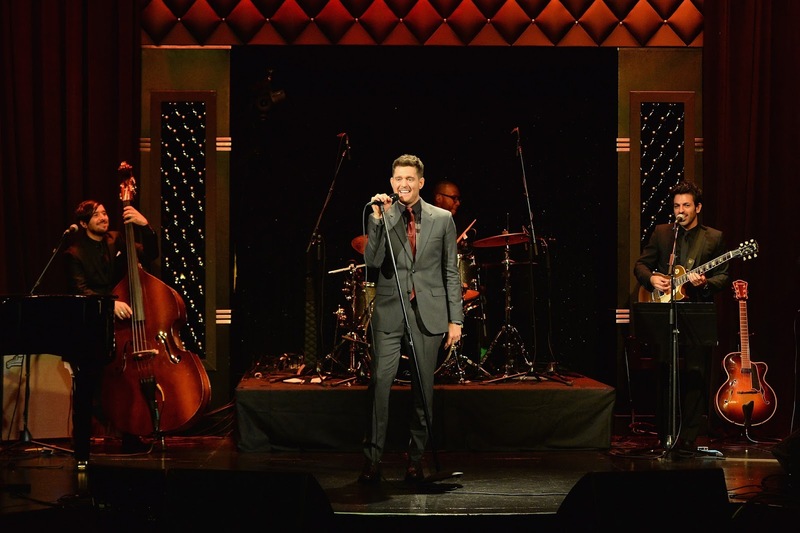 Are you a Buble fan? 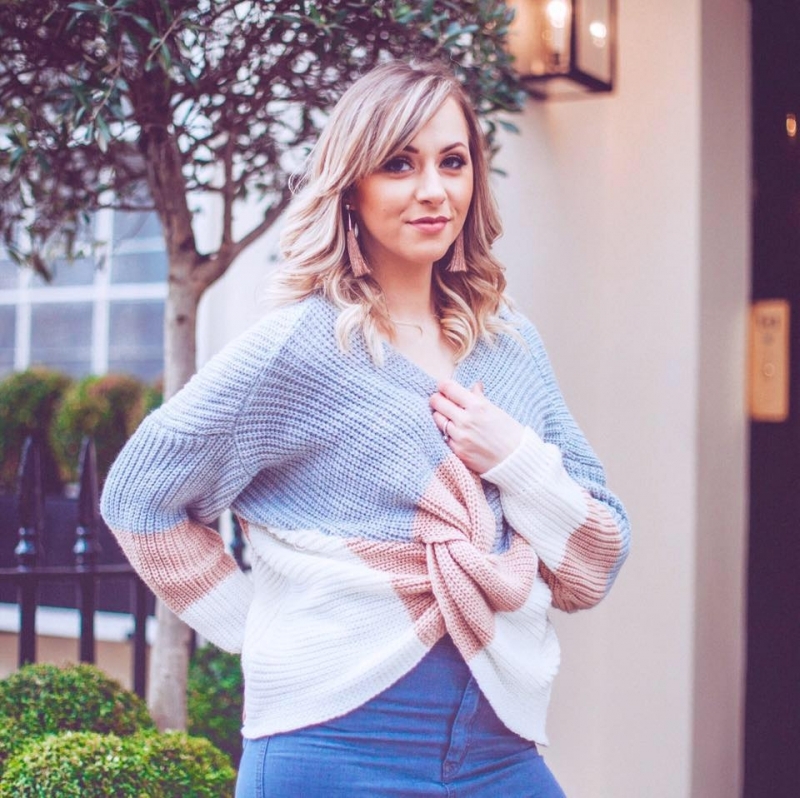 Will you be giving this a go?